Once Orville and Wilbur Wright proved, in 1903, that flying was possible, every hotshot who could scrape up lumber and sheets wanted to soar with the birds. Aviation's first 15 years were filled with adventure. Daredevils smitten by the clouds dreamed up their own craftsponderous dirigibles to primitive helicopters to crude spruce-and-linen biplanesin search of thrills and chills. At first, they flew just for the glory of sailing above the crowds and making a few bucks giving rides at air shows and county fairs. Later, far-sighted businessmen would realize aviation's commercial possibilitieshauling passengers and mailand the course of flying would be forever changed. Wichita's early aviation history began in 1908, a mere five years after the Wright brothers first flew on Kill Devil Hill near Kitty Hawk, NC. The Commercial Club, forerunner of the Chamber of Commerce, brought dirigible pilot Roy Knabenshue to Wichita to perform during the city's Peerless Prophet's Jubilee celebration Oct 12-17, 1908. Knabenshue had a national reputation as "the man who hedge hopped over the lampposts of Broadway." But he didn't have much luck hopping over hedge rows in Wichita. Strong winds each day prevented his 150-foot-long, cigar-shaped blimpwith a catwalk underneath that carried two 20hp enginesfrom getting off the ground. Knabenshue left town when the Jubilee ended. 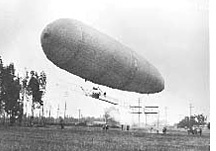 But a few days later, another pilot, Frank Goodale, managed to get about 50 feet up before gusty winds tore the dirigible apart and tossed it to the ground. But in makeshift workshops across Kansas and the rest of the country, early "aeronauts" continued experimenting, often altering crude drawings in books to fit their own engineering ideas. Bob Pickett, former historian for Cessna Aircraft Co, said that many of the early inventors had turned to flying after their interest in sports such as car racing palled. 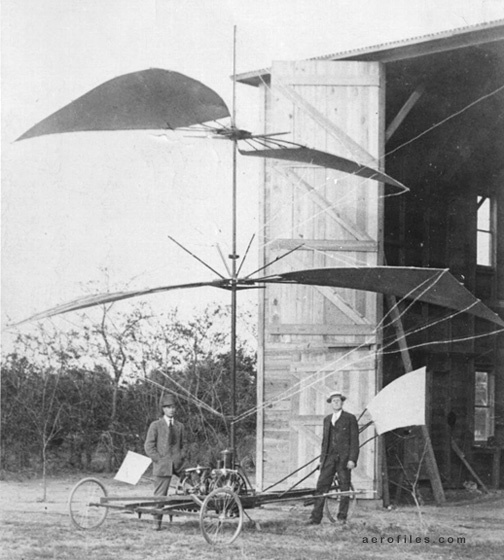 In February 1908, a New York lawyer, author and lecturer named Henry Laurens Call came to Girard in southeast Kansas with blueprints of a flying machine and established the Aerial Navigation Co of America Inc. Call was born in Ohio, raised in Silver Lake KS, and attended Kansas State Agricultural College from 1879 to 1881, according to school records. Described in later years as "tall, raw-boned, energetic and persuasive," he talked nearly everyone in Girardfrom hotel porters to bankersinto anteing up a total of $2,500 to start an airplane factory in a rented lumberyard. Much of Call's financial backing came from J A Wayland, who published Appeal To Reason, a nationally known socialist newspaper, said William Cuthbertson, a Girard historian. Girard was then a center of Socialist activities. The men were to leave Girard in the morning and dine in Chicago that evening. To make the trip, Call built a four-winged contraption with two engines and four propellers, the Call Mayfly. It was dubbed the "Mayfly" because locals said that it "may fly." But the plane wasn't finished until July 9, 1908, and never got off the ground, according to research by Duane Thiessen of Pittsburg State University in 1973. The plane was ludicrous. Another Girard historian wrote in 1921 that "a local businessmen commented that it was about the same size as a haystack, and about as likely to fly." Call apparently built at least 14 more craft of various designs, including one dubbed the "Whynot," but only one flew, a French Nieuport lookalike that briefly took to the air Sept 30, 1912. Thiessen said that Call's unscientific approach was strange, because he "had studied math and physics at Manhattan College in New York, and was a member of the American Academy for the Advancement of Sciences." The company went bankrupt in 1912, and Call left Girard. Five years later, at age 50, he was killed flying a plane in Wisconsin. In 1909, the year after Call began experimenting in Girard, a couple of Rock Island railroad machinists in Goodland quit their jobs to build a primitive helicopter. 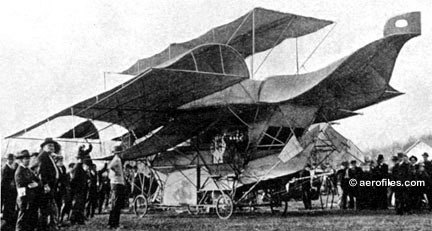 Charles A Wilson and William J Purvis built the machine, which had twin sets of blades that spun in opposite directions, and gave a demonstration flight on Thanksgiving Day 1909. But that was enough to convince residents to buy stock in the venture, the Goodland Aviation Co. Daise said a second machine took to the air in June 1910, "but it was torn up in the air and never rebuilt." The company folded, and its equipment was sold a few months later to one of the original investors. Other helicopters had been built and flown, but in 1910 the government granted the Goodland machine the first patent for any rotary-winged aircraft in the country. Harold Norton of Brewster, a pilot who built the replica, said the Purvis-Wilson helicopter may have been capable of hovering a few feet but that it was incapable of horizontal flight. "The sorry part of it is that if there hadn't been so much fun made of it, if there had been a little more money put into it and interest shown in it, they might have worked the bugs out of it," he said. In October 1910, in the southwest Kansas town of Jetmore, an equally weird experiment took place. A E Hunt, a blacksmith, spent about two years hammering out his all-metal Hunt Rotary flying machine. The machine reportedly was made of angle iron and gas pipe, and weighed somewhere between one and four tons. Hunt posed for photographers before attempting his ill-fated maiden flight. "That was quite a sight," C L Hubbell, who was a spectator, recalled in a 1971 interview. "The rotary units on top were made of tin. They turned pretty fast, making an awful vibration and an awful noise. The whole thing was really vibrating." "He tried to fly but he couldn't get it off the ground," said Alta Wilson, a Jetmore resident who heard stories about Hunt. "He was a sad, disappointed person." "It is altogether possible that from the failure of this machine others gathered knowledge which has made the current helicopter possible," Ole Haff, who saw the Hunt machine in his youth, recalled in a 1956 interview. "Mr Hunt should not be forgotten. He was a pioneer. He pointed the way."